After breaking one hundred miles yesterday I started the morning optimistic about being able to pull off another long miles day. It isn't that I've had an attitude change about wanting to take it slow and see the sights, but I'm going to be attending a wedding in the end of June and the closer I can get to Northern Colorado by then the easier it will be for me. When I left Katy's house to find a restaurant in town the wind was still coming from the east, but by the time I finished eating it had meandered around and was now coming out of the south with gusts around twenty-five miles per hour. It turns out that while a crosswind isn't as bad as a headwind, it is somewhat like swimming across a stream in that you have to expend extra concentration and energy just to travel in a straight line. My two choices for good destinations for the day were 60 and 135 miles away respectively and I while I was still hoping to make the further one it was looking less likely. Studying my map I saw that the planned route took a loop to the south before turning north and finally west. The southern loop was necessary to stay on paved roads, but I spotted a shortcut that would shave about six miles off my route if I were willing to give gravel roads a shot. I was still hoping that by avoiding fighting the wind into the southern leg, and by shortening my route a little bit, I might be able to make the furthest destination. With this in mind I forked off of the planned route and started down the gravel trail. It was perhaps a little foolhardy for me to venture onto unpaved roads. I'm currently not carrying a spare tube and won't be able to get one until somewhere two or three days hence. While I can certainly patch minor leaks that my tires develop, I've been warned that the Kansas backcountry can be quite thorn infested. On top of that, the road I selected continued to worsen in quality until at points it would perhaps have been better suited for a mountain bike. I was fortunate that nothing went amiss and I rejoined the main trail near the town of Toronto. With a few more hours riding I arrived in Eureka and it was clear that I couldn't make the next town before sunset. Despite this, it was still early in the day and too hot and humid to camp comfortably. 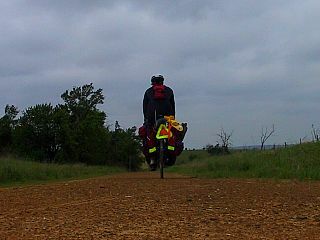 I hadn't been able to shower yesterday, so I was bearing the dirt and sweat of 160 miles of riding. Even though there was a perfectly good city park I could stay in, I voted unanimously to stay in a motel instead. In the evening, just as I ventured out of my room to round up some dinner, I met two more cyclists on the trail. 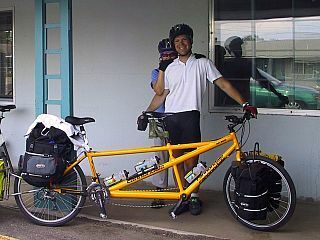 Greg and Jennifer are a recently married couple who are fulfilling one of Greg's dreams by crossing the country on a tandem bicycle. They are the second batch of eastbounders I have met, and like the first ones they took the Western Express route across California, Nevada, and Utah before meeting the TransAm trail in Colorado. After I had my dinner, and they set up camp in the park, I had them come to my room where we visited for a few hours. I shared with them a handful of names of people and places to see ahead, and they did the same for me.